I was recently on a flight in which the in flight snack was a ginger apricot cookie that was chewy and filling. I wanted to recreate something similar at home, so for this recipe, I just added ingredients until I achieved the texture I wanted. I had two objectives for this cookie: Firstly, to make a dense breakfast cookie. Second, to make a cookie that doesn't rely on cinnamon for flavour. If you follow this blog, you may have noticed I use cinnamon and nutmeg in almost all my baked goods and desserts. I try to use as little added sugars as possible, so cinnamon is usually the easiest way to add flavour without adding more sugar. Don't get me wrong--I love cinnamon!...but I wanted to try something different this time, so ginger it is. 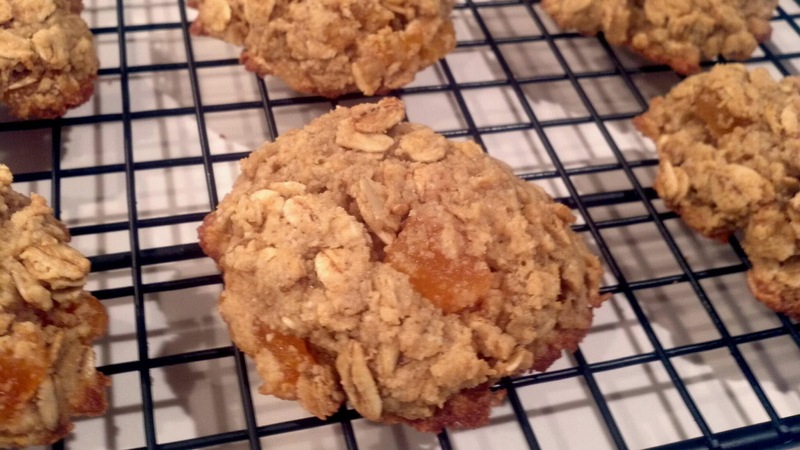 This recipe can be made gluten free by purchasing oats labelled Gluten Free. Oats do not contain gluten, but can be subject to cross contamination during packaging. Preheat oven to 350 degrees F. Grease a cookie sheet with Canola spray. Chop dried apricots into small chunks (about the size of a raisin). Set aside. In a large mixing bowl, combine oats, ground almonds, salt, baking soda, ground and fresh ginger and mix until uniform. Add egg, maple syrup, molasses, coconut oil and apricot pieces and mix until oats and almonds are coated with liquid. Scoop out dough in tightly packed circles and place evenly distanced on cookie sheet. Use a fork to flatten tops of cookies. Place in the oven and bake for 8 minutes. Allow to cool on pan for 5 minutes before transferring to cooling rack.